This week Krusteaz launched four new gluten-free products, including the Confetti Buttermilk Pancake Mix – a fun idea for parents to help make every day a birthday! 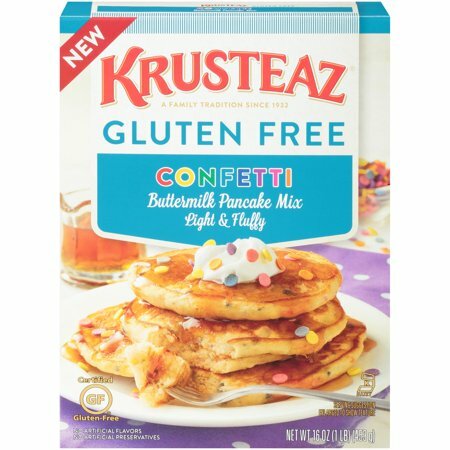 The other three new mixes are gluten-free versions of the classic flavors consumers crave the most: the Yellow Cake Mix, Chocolate Cake Mix, and Chocolate Chip Cookie Mix. The new confetti filled mix is not only an incredibly Instagram-worthy, delicious gluten-free option, but it is a “piece of cake” to make! Prepared by just adding water, kids (or kids at heart) can help make and enjoy this fun breakfast or birthday treat, in a matter of minutes. The mix can also be made by adding eggs and milk for extra protein. All four new mixes have an SRP of $3.98 and can be found now in the baking aisle at Walmart and online at Walmart.com. · Funfetti Pancake Cookies: The fun doesn’t have to stop at pancakes! Use the mix to make birthday cookies, perfect for entertaining at birthday parties so even your gluten-free guests can enjoy. · Sheet Pan Pancakes: The closest thing to a birthday cake you can find! With flipping required and baked on a sheet pan, you can have these fun rainbow pancakes ready for a large crowd in no time.